Tipper is hoping that her recent hike to the top of Red Hill (2,030 ft.) will be her final journey en route to finding a family to call her own. This approximately six-year old mixed breed has been on a mission to find a forever family for a long time. The first two years of life for this friendly Labrador/rottweiler are a bit of a mystery, but we do know that Tipper resided in a shelter for the past four years. A few months ago, Tipper was fortunate to find her way to Almost Home Rescue and their caring network of volunteer foster families who provide temporary homes for dogs waiting to be adopted. 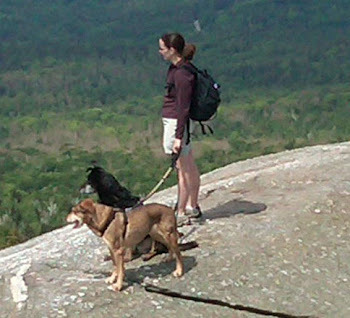 With so many years spent in a kennel, Tipper needed to catch up on her outdoor time, and a scenic hike to the top of Red Hill located in Moultonborough and Sandwich, New Hampshire seemed an ideal place for her to start. Tipper was a bit shy when I first met her, but she quickly warmed up to me and my friend Karen who accompanied us on our 4.3 mile hike. With the benefit of two cars to park at separate trailheads, we elected to ascend via the Eagle Cliff trail and descend using the Red Hill trail. While the Eagle Cliff trail is a longer and more challenging route to the summit, the views from along the cliffs are worth the extra effort. Tipper politely led the way and climbed over boulders and trees as if such hikes were part of her daily routine. Several trees that were recently blown down by the force of Hurricane Irene were no match for Tipper's hopping ability. She easily found her way up and over or around such obstacles. Tipper also did not let her initial shyness prevent her from interacting with people and pets along the way and during our stay at the summit. She enjoyed the company of fellow hikers of both the human and canine variety. While spending time atop Red Hill, Tipper enjoyed a few treats and several drinks of water while interacting with a number of people and dogs. Of course, she also posed for several more photos while we explained that Tipper was hiking in search of a home as part of Foster Dog Summit and indicated where her adoption application details could be located online. We were especially interested to hear fellow hikers' stories of their own rescue dogs, and we encouraged them to consider becoming a temporary home for a dog in need of rescue from an overcrowded animal shelter. They were very polite in allowing Tipper to interact with their canine companions and have photos taken. Be sure to visit Tipper's online photo album for more pictures of her adventures on the trail. One hiker remarked that, "Tipper is a perfect medium size dog that many people should consider adopting!" Celebrating the end of the hike! Please visit and share Tipper's page on Petfinder.com and help find a home to call her very own! If you are interested in supporting a foster dog program or would like to learn more about how to become a foster family for a dog in need visit Almost Home Rescue. The sooner a homeless dog is provided the opportunity to live in a foster home, the better he or she will become acclimated to a variety of people, pets and situations - all wonderful experiences that prepare a dog to be a lifelong companion! This is a Great blog! Who needs a book? Nothing like true stories with great picture's and wonderful outcomes for so many dogs hiking their way to their new future family! I look forward to all the reading of new post's in the future! This is "Good for your Soul" reading! Thank you, Janet. I really appreciate your kind words. My sincere thanks to rescuers like you who work so hard to make sure these dogs all get a second chance and the opportunity to hike for homes!